HOLLYWOOD — In 1979, the Tribe’s first foray into high-stakes bingo opened on the site of today’s Classic Casino with an unassuming metal building; now, 34 years later, it celebrated a $10-million renovation and continues to be a big draw. Looking back, it’s easy to see the evolution from bingo to the Tribe’s wildly successful and wide-ranging gaming business. But from the perspective of the leaders of the time, it was all a gamble – one that paid off in spades for the Seminoles and other Tribes across the United States. Former Chairman Howard Tommie considered the concept of high-stakes bingo but left office before implementing it. When Chairman Billie took office in 1979, he saw a huge opportunity in bingo, even though Florida law only allowed nonprofit bingo halls to open two days a week and have a maximum jackpot of $100. The Seminoles opened the bingo hall anyway and became the first federally recognized Tribe to operate one on a reservation. When it opened, then-Broward County Sheriff Bob Butterworth immediately tried to shut it down. The Tribe sued the state, claiming sovereignty rights protected them from state interference by the U.S. government. The legal war had begun. At the time, Chairman Billie’s camp was at the Native Village, across U.S. 441 from the bingo hall. After years of court battles, the existing state laws regulating bingo were ruled irrelevant because of Tribal sovereignty. After the U.S. Court of Appeals sided with the Seminoles, the case – Seminole Tribe of Florida v. Butterworth – was heard by the U.S. Supreme Court. In 1981, the high court sided with the Tribe, ruling it had the right to operate the high-stakes bingo hall, which ultimately opened the door to Indian gaming throughout the United States. In 1987, the Supreme Court ruled in another case – California v. Cabazon Band of Mission Indians – that federally recognized Tribes could operate casinos outside state jurisdiction because of their sovereign status and that states could not prohibit them from doing so. After federal approval, Congress passed the Indian Gaming Regulatory Act (IGRA) in 1988 to establish rules for Indian gaming. The intent of IGRA was to promote Tribal self-sufficiency, to ensure Indians were the primary benefactors of gambling, to establish fair and honest gaming, to prevent organized crime and other corruption by providing regulation, and to establish standards for the National Indian Gaming Commission. Since then, Indian gaming nationwide has grown dramatically. Currently, 240 federally recognized Tribes operate 460 casinos on reservations throughout the United States. Gaming brought the Tribe from poverty to prosperity in a few short years. The newfound comfort has allowed the Tribe to be self-sufficient and spend a significant portion of casino revenue on social services and cultural programs. Health care, education, recreation and programs for elders and children are a few of the Tribal benefits. In addition to being responsible for the start of Indian gaming nationwide, the Tribe was the first to pursue and embrace the casino economy, despite its cultural conservatism. According to anthropologist Jessica R. Cattelino, of the University of California, Los Angeles, author of” High Stakes: Seminole Gaming and Sovereignty,” the Tribe is able to separate the source of money from its use and views casinos as an economic project that enables it to pursue cultural ones. Seminole cultural values and economic development have been intertwined throughout the 20th century. Before gaming, cattle, crafts and alligator wresting were among the Tribe’s essential cultural traits and income sources. Even with the monetary benefits of gaming, those endeavors are still key components of Tribal character. But, gaming income has allowed the cultural distinction of the Tribe to continue through the Culture Department, classes and Tribal events that define, preserve and strengthen Seminole identity. Although still intact, the building has expanded over the years. The latest $10-million renovation includes efficient new heating, ventilation and air-conditioning units, a new color scheme with paint and carpeting to match, wider aisles between slot machines, a refurbished bar, renovated and updated bathrooms, and enlarged photos of the casino’s history displayed on the walls. In addition, a new gaming area boasts the loosest slots in America: Each of the 29 machines has a chip that pays out 98 percent of the time or more. Although the 72,751-square-foot building is a classic, it is too young to be designated a historic site. To qualify as a Florida Heritage Landmark, buildings must be at least 50 years old. The festive Jan. 17 ribbon cutting was complete with celebrities and entertainment. The theme was the 1970s, and music of the era filled the casino. Actor Jimmie “J.J.” Walker, of 1970s television sitcom” Good Times” fame, welcomed the crowd to “one of the finest casinos in America.” Dwight Stephenson, the former Miami Dolphins football team center and member of the Pro Football Hall of Fame, presented a lucky patron with two tickets to the Super Bowl, courtesy of the casino. The Sugarhill Gang, whose 1979 hit “Rapper’s Delight” was the first hip hop single in the Top 40, performed a lively set. 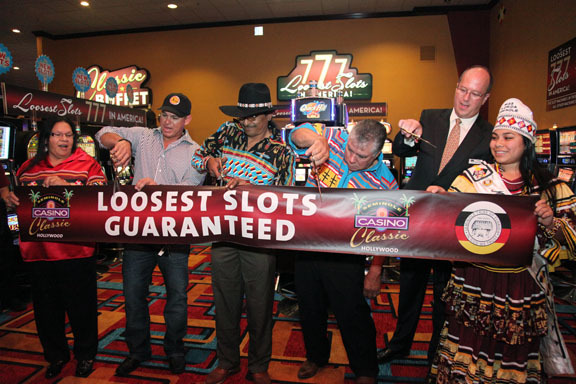 Tribal dignitaries capped the event with the honorary ribbon cutting at the new Loosest Slots in America gaming area. Hollywood Board Rep. Chris Osceola, who has worked at the casino for 20 years and is now director of security, has had a front-row seat to all the changes throughout the years.